With a few hours delay we left the port of Las Palmas on Gran Canaria to sail to the Ligurian Sea. The start of MSM 71 indeed proved stormy: The Atlantic waters greeted us with winds of 7 Bft and gales of up to 10 Bft with waves of 6 m height. 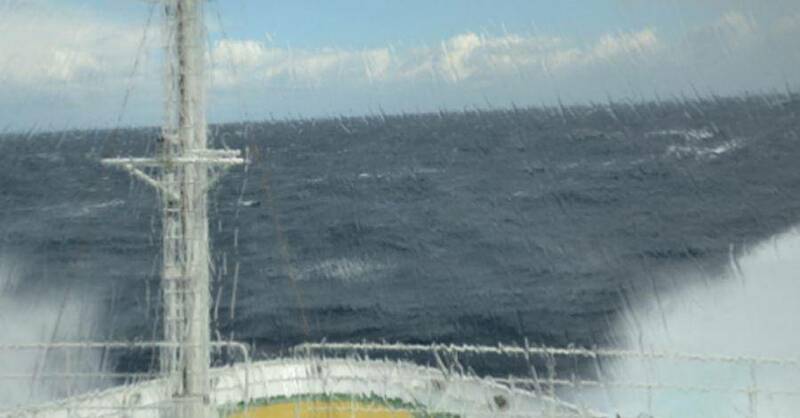 Nonetheless, everybody on board is doing fine and adjusting to the shaky conditions. The target of our expedition is to explore the deep roots of the Alps for a better understanding of their origin. Hold on now, the Alps? How does that go together, a research cruise and a continental mountain chain? Wouldn’t it make more sense to pack in trekking boots and hiking poles instead of life vests and safety helmets? Well, the Alps are located at the transition between two major tectonic plates: Africa and Europe. This ‘crumple zone’ extends far beyond the Alps proper all the way into the Ligurian Sea offshore southern France and northern Italy. Between the two larger plates a number of smaller microplates are trapped in the Alpine region. Sounds complex? We agree, and that is way we have teamed up with 50 scientific institutions from 18 European countries to cover the Alpine region with a dense network of seismometers to record the signals from the deep in high resolution. Our work onboard RV Maria S. Merian is just one piece of the puzzle with the goal to detect seismic signals on the seafloor using ocean bottom seismometers. An international project calls for international teams and so on board RV Merian scientists from GEOMAR Helmholtz Centre of Ocean Research Kiel and University of Kiel are joined by colleagues from France, the Netherlands, and China. In addition, are cruise is supported onshore by colleagues from Italy who will install land stations in Liguria and on Corsica during our cruise….more on that later on….right now we are sailing north, trying to defy the wind and the waves and preparing for first instrument tests tomorrow. In this blog we will report on the working progress of our experiment as well as on life and work at sea. Research vessels are unique working places with limited space and we look forward to sharing our daily lives with you via this blog. Chief Scientist MSM-71, in transit from Las Palmas to the Gulf of Lions. This entry was posted in plate tectonics.